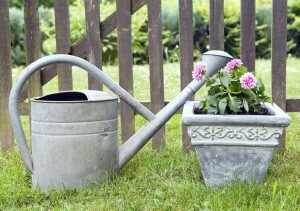 Spring is finally here, and the warm weather and soft rains make this the perfect time to get your garden going. Whether you have a vegetable garden or a decorative garden, you work hard to reap what you sow, and you want your garden to both look good, and be productive if it’s a food producer. However, there is one big obstacle to a healthy garden that only a fence can keep out. You guessed it, animals. Animals love to wander into your garden and feed on your vegetables which you labored so hard to produce. Even if there’s no food in the garden, wandering animals can stamp down flowers and turn your garden into a mess of dirt and dead flowers. And it’s not just animals like deer that you have to watch out for. Your own dog might take to digging in the garden and make it his own personal excavation site. This simply won’t do. Protect your garden from large animals friendly and foe with a garden fence. What kind of fence is best for a garden? For vegetable gardens, you really can’t go wrong with a wood picket fence. Leave little or no space in between the slats to prevent creatures from poking their heads in to take a bite. For floral gardens, you might prefer something that offers a better view but still protects it from wandering animals. In this case, your options include everything from wood to vinyl to aluminum to iron. This year, don’t let animals get the best of your garden. Install a garden fence and stake claim to what’s yours. This entry was posted on Friday, May 9th, 2014 at 3:37 pm. Both comments and pings are currently closed.